The tacos lengua (left) and cabeza. Chairez is originally from Valparaíso, Zacatecas. While visiting her sister in Oakland, Chairez noticed there weren’t any restaurants serving dishes from her home state, and she immediately saw a business opportunity. So in June 2017, she opened Mi Zacatecas. For Chairez, re-creating the familiar flavors of Zacatecas starts with spices straight from the region itself: dried red peppers, cloves, herbs, and black pepper. Chairez stocks up every time she visits home, and when her mother comes to visit from Zacatecas, she brings some spices with her, too. For her customers who also hail from Zacatecas, it’s a reminder of flavors they may not have tasted in many years. “They say, ‘Wow, they’re so similar to the ones we had there,’” Chairez said. The one item on the menu that’s most representative of Zacatecas, according to Chairez, is the gordita. While gorditas are often deep-fried and crunchy, the gorditas from Zacatecas are soft and pillowy, cooked with minimal oil. They’re thick and chewy on one side, while the other is paper-thin, with lightly charred, leopard-like spots that lend a mild, toasty flavor. And while other regions’ versions of gorditas are stuffed with garnishes like sour cream, cheese, and lettuce, Chairez said the gorditas in Zacatecas tend to be more straightforward: a simple stew or meat tucked inside a handmade masa shell. With a dish that relies on only two components, Chairez makes the gorditas fresh to order. The food may take a bit longer than other restaurants, but it’s well worth the wait. The gordita stuffed with picadillo was equally satisfying, with ground beef and potatoes in a similar red salsa. The potatoes added creamy, silky flavor and texture, while the beef and salsa packed an umami punch that made this dish a satisfying, rainy day comfort food. Don’t miss the gordita filled with rajas con queso, either. It’s filled with stringy, melty, and tangy white cheese, tender grilled green peppers, and sweet caramelized onions. The lengua, cabeza, and maciza are steamed for three hours and make excellent fillings for tacos. “That makes the flavor different and juicy,” Chairez said. The lengua was exceptionally tender, without the chewiness that’s typical at some taquerias. The cabeza was rich, fatty, and fell apart with each bite. The maciza, a steamed version of carne asada, was lean yet juicy. 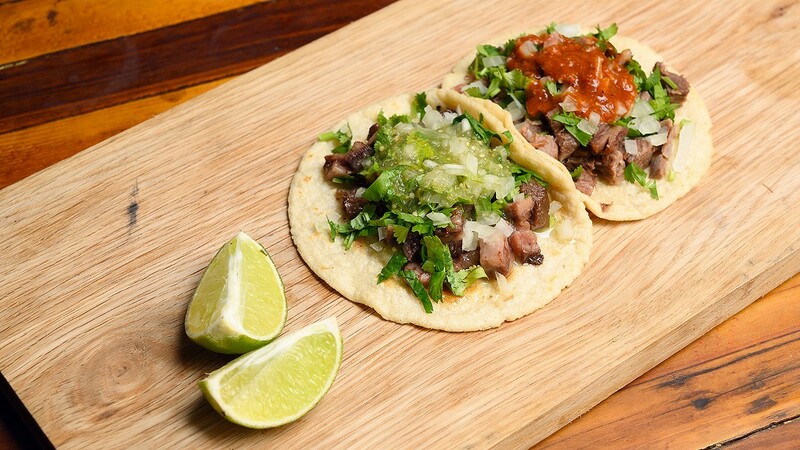 The tacos come served on yellow corn tortillas, sprinkled with onions and cilantro. Top the tacos with the housemade red salsa, made with red chile peppers from Valparaíso, or the green salsa made with serrano peppers, tomatillo, and garlic. Cool off with a housemade jamaica or horchata, both of which were refreshing and not overly sweet. The best time to visit Mi Zacatecas, though, is on the weekend, when you can try specials like the barbacoa, which is rubbed in a blend of spices, then simmered overnight. The small barbacoa plate had a generous amount of fork-tender beef served in its simmering juices, and the giant, warm handmade tortillas served on the side were particularly good. The barbacoa tacos, served on smaller handmade tortillas, were easier to eat, but the meat wasn’t quite as juicy. Then there’s the menudo, made by simmering honeycomb tripe overnight with red salsa, garlic, and epazote. Chairez recommends arriving early if you’ve got your heart set on barbacoa or menudo, since the restaurant sometimes runs out by noon. Depending on when you visit, you might also find fresh homemade pan dulce made by Chairez’s friends who used to run a panaderia in Mexico. Or you might be able to score a piece of the flan, which was rich, eggy, and mildly sweet. Mi Zacatecas fills a void in the East Bay’s roster of regional Mexican cuisine, but it’s also a woman-owned, family-run, and community-oriented restaurant that I can’t help but root for. Chairez learned how to cook from her mother, and though her mother still lives in Zacatecas, Chairez asks her mother for feedback every time she visits Oakland. Plus, Chairez runs the restaurant along with her teenage daughter, whom she calls her “right-hander.” When she’s not busy running Mi Zacatecas, Chairez also gives back to the community. She’s cooked for school and church fundraisers, and she served 300 people for the Million Dollar Meals event at St. Mary’s Center in West Oakland. What’s perhaps most compelling of all, though, is Chairez’s conviction that if you serve good food, people will come. And she’s right. During the week, you’ll see people stopping by on their lunch break for tacos and gorditas, and on weekends, families crowd the patio for barbacoa and menudo. “When I opened the restaurant, I didn’t have any idea how to do it, but I know that I have a dream that can come true,” she said.